All instruction is presented in a fun, uplifting manner – without pressure. All content is intended to be stimulating and thought-provoking. Learning is highly experiential and hands-on. Students in each grade all have math at the same time, but learn in different classrooms based on their math level. The math program is still structured to allow students to progress at their own pace, based on their math ability, maturity, study habits, and organization. Because of the high ratio of teachers to students, teachers are able to individually assess progress, verify that concepts have been mastered, and relate current material to previous lessons. At the end of each year, teachers make recommendations regarding each child’s math class placement. The traditional levels of placement are: Course 1, Course 2, Course 3, Pre-algebra. At The Nysmith School, our goal is to make school fun for your child. Math is no different. Our math teachers are hired specifically to teach math. Each math teacher has a strong background in math and is passionate about inspiring your child to love math as well. We maintain a 1:9 teacher-student ratio and minimize both repetition in the classroom as well as homework. We want your child to love math. Part of instilling the love of math in your child is to find the appropriate math level for them. We take that responsibility seriously. Our math program in the upper grades operates differently than it does in the lower grades. In grades preschool through third grade we diversify the math levels up to four grade levels above grade within the children’s math class. Beginning in fourth grade, the children in each grade all have math at the same time but go to different classrooms depending on their math level. We realize that every child has different abilities and aptitudes. Our math program is designed to allow your child the flexibility to progress to different levels if their math ability, maturity, study habits, and organization will allow them to be successful at higher levels. Our goal is not to race your child through math, but to find the correct level that will challenge but not frustrate your child. One of the benefits of our 1:9 ratio is that we are able to work with your child daily and see how quickly they pick up information, relate it to previous lessons, and assess when they are able to progress. Until your child reaches high school transcript classes, there are many different progressions. If your child demonstrates a high level of aptitude and skills, it is possible to progress from Course 1 to Course 3, skipping Course 2. Likewise your child can progress from Course 2 to pre-algebra. It is worth reiterating that the goal is to find the appropriate math level for your child that will allow them to be successful without frustrating them. The main goals of the program are to promote clear thinking and solid communication skills. Students gain skills in literary analysis, writing, research, and speaking. Programs are highly experiential; modes include play scenes, oral presentations, group discussions, mock trials, debates, and writing contests. Teachers guide students in their understanding of literature as a study of ethics, psychology, and philosophy. The curriculum underscores the importance of integrity, self-knowledge, and action to improve the world around us. Nysmith language arts teachers passionately believe that clear thinking and communication are essential components of a successful life. Teachers and students build deep relationships as they explore literary classics and personal student writing. Delving into great literature, teachers and students explore the great questions human beings have posed since the earliest writing. Nysmith students know that they are engaged in serious intellectual work as they gain skills in literary analysis, writing, research, and speaking. Together, teachers and students discuss characters from great works of literature, wrestling with issues concerning fate and free will, loyalty, forgiveness, community, and honor. Along the way, Nysmith students develop academic skills in speaking, listening to others, and writing. Most importantly, students learn to apply these questions to their own lives, developing their personal goals and sense of identity. Nysmith language arts teachers guide students in their understanding of literature as a study of ethics, psychology, and philosophy. Through literature, students examine the values and morals of past and present cultures. Using reading and writing as the key to discovery, students will evaluate the world and their place in it. Ethics is the heart of the Nysmith literature program. From the 4th grade discussions of poaching to survive in Roald Dahl’s Danny, the Champion of the World to examining Dr. Frankenstein’s conflict with his creature in 8th grade, the choices that characters make are related to the choices that confront all of us. The content is important and deep, but we have fun! Shakespeare scenes are acted, oral presentations are moving and vivid, and discussions are lively. Mock trials, debates, and writing contests add to the texture of the program. Alumni come back year after year to visit the teachers who have accompanied them on their journey. They tell us that their analytical and writing skills set them apart from their peers. Their high schools tell us that their character sets them apart; Nysmith students are known for their integrity and their focus on making their communities the best they can be. 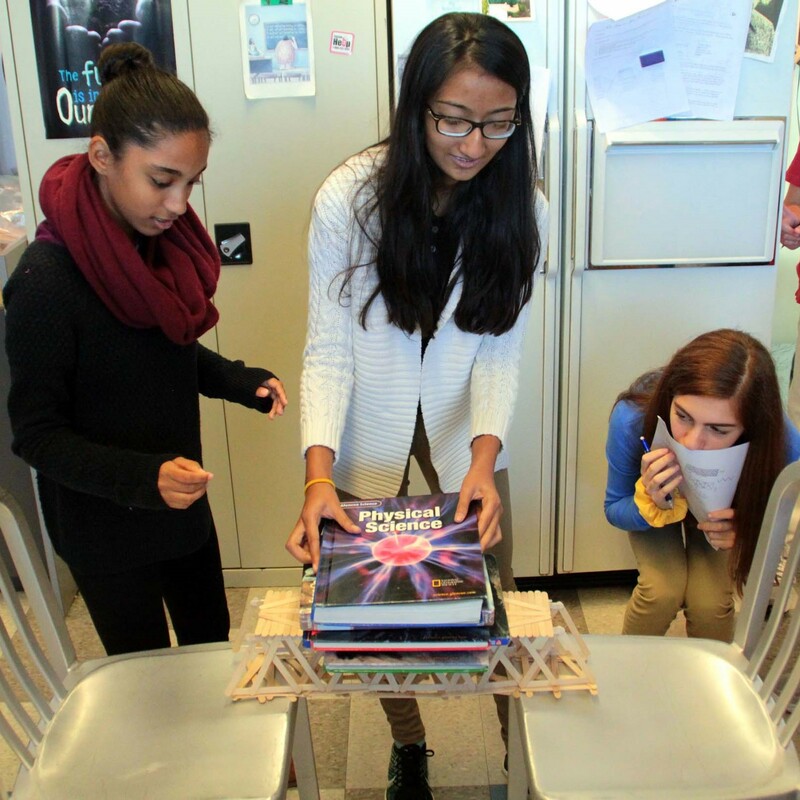 Nysmith science classes feature hands-on labs, projects, demonstrations, presentations, creative lessons, and inspired teachers. Students are introduced to concepts and materials when they’re ready – often years before most schools would dream of introducing them. Field trips help students see the variety of work being done by scientists in the “real world.” Trips may include zoos, farms, the Chesapeake Bay, arboretums, and observatories. Guest speakers come regularly to discuss their work, and their fields in general. 5th Grade: Biology is emphasized at this level. The units of study include chemical foundations of cells, cell structure, metabolism, principles of evolution, anatomy and physiology, plant structures and function, and ecology. Students dissect a fetal pig and present their science fair project to their classmates. 6th Grade: Chemistry is emphasized at this level. The units of study include the elements, acids and bases, chemical reactions, nuclear radiation, genetics, and forensics. 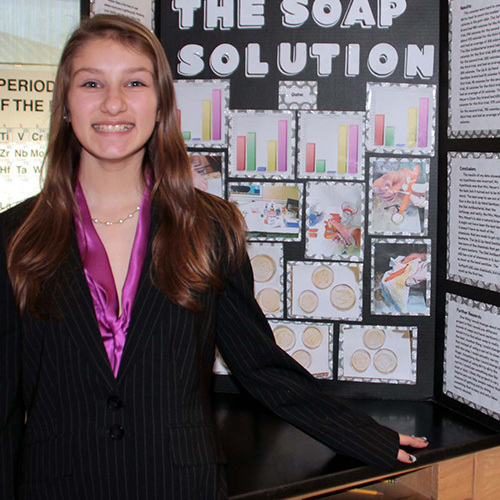 Students’ science fair projects are presented to judges during the school day. 7th Grade: Environmental Science is the focus during this year. Students study the Earth as a working system by exploring the Biosphere, Hydrosphere, Geosphere and Atmosphere. They make connections between sphere basics and environment concerns such as pollution, biodiversity and sustainability. Science Fair projects are presented to judges in a special fair after the school day. 8th Grade: At this level, students focus on physics. The units of study include mechanics, properties of matter, sound and light, and heat transfer. Students present their science fair projects to judges after the regular school day. 3 hours 45 minutes per week. Science is fun. We love science at The Nysmith School. We believe that nurturing your child’s interest and confidence in science will not only help them prepare for high school science; our science classes have prepared many students for a life-long STEM career. Nysmith science teachers have a profound knowledge and love of science. Their goal is to inspire and motivate your child so that they, too, love science. Through the use of hands-on labs, projects, and student presentations, creative lesson plans, and teacher passion, we introduce students to concepts and material many years before most schools. However, while teachers present rich content, they have a very child-centered approach. Their primary mission is for your child to love science. There are two teachers in each class of 18 children. Every child from kindergarten through eighth grade has almost four hours of hands-on science each week. Two teachers in each class help your child succeed, by facilitating the labs and directly engaging with your child’s exploration and discovery. The goal is not to prep your child for specific science and technology high schools, but rather to excite and motivate them so that they see the great joy scientific exploration brings. And, through their Nysmith experiences, your child will see the variety of opportunities in science that are available to them in their future. Field trips help your child see the variety of science done by real scientists in the real world. Students experience biology-related trips, visiting zoos, farms, the Chesapeake Bay, and arboretums, as well as trips to observatories to collect data. 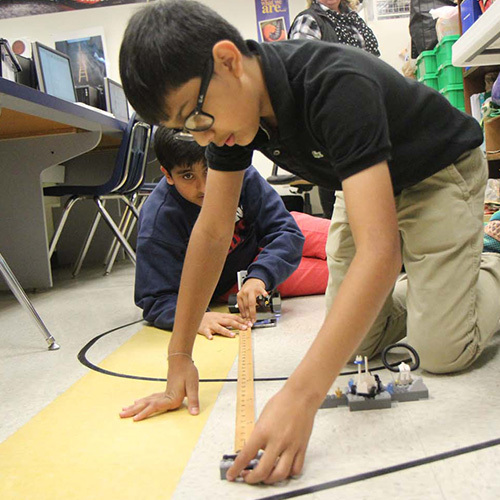 Guest speakers come regularly to discuss their fields and research, and The Nysmith School is an X-STEM School, affiliated with both the USA Science Festival and the Washington Executive Council (WEC), and hosts the WEC’s annual K-12 STEM Symposium. Many students who go on to attend Thomas Jefferson High School for Science and Technology mention that a substantial portion of their freshman biology course was introduced in their fifth-grade biology class at The Nysmith School. The biggest difference is that our approach to teaching science is very child-friendly. We are able to provide your child a framework of knowledge and background that facilitates the finer details that they will be introduced to in high school. The goals of the program are to instill a love of history, help students recognize and respect diverse points of view, and apply analytic skills to opinions and contradictory texts. Our hands-on, living history approach uses thoughtful and compassionate discussions to imagine and explore alternative historical solutions and paths. We tightly tie together elements of art and social studies; this approach enriches both disciplines. The curriculum is enriched by a large number of field trips throughout the year. 4th Grade: Students study mapping, geography, ancient Rome, the Westward Expansion, the War of 1812 and the American Civil War. 5th Grade: The units of study include geography, Latin America studies, the Middle Ages, American Reconstruction, immigration, and the Wild West. 6th Grade: Students study American history from 1898 through World War II, the history of the African continent, and the Renaissance. 7th Grade: The units of study include American history 1945 to present, economics, the U.S. Constitution, and the cultures of India and Pakistan. 8th Grade: Students study Japan and China, the French Revolution and Napoleon, the nationalist movements in Africa, and much more! The Nysmith School specifically hires teachers who love history to teach your child social studies. We teach a hands on living history perspective. The goal of the Nysmith social studies program is to teach your child a love of history, and recognition of different points of view of both historical and cultural elements. Each grade in social studies has several units that they study over the course of the year. The units include an ancient history unit, an American history unit, and several culture units as well. We also tie art into the social studies curriculum. Where a lot of The Nysmith School curriculum is project based and involves a lot of arts and crafts to illustrate the lessons your child is learning, in the art labs, art teachers teach your child art techniques tied together with the historical content. In addition to the hands-on projects, Nysmith students participate in a lot of field trips. Each class averages eight to ten field trips per year. One of the benefits of The Nysmith School is that we do not spend a lot of time preparing for standardized testing. Instead we are able to have thoughtful, intellectual, and compassionate discussions about many elements of social studies to fully explore alternative solutions, and alternative paths of history. This deeper thinking allows thoughtful children to more fully explore the human experience. The school also participates in the National Geography Bee, as well as the Model United Nations. Technology is treated as an enabler of ideas; students can use it to communicate more easily and effectively. Students apply technology to solve problems and create projects. We teach logical sequencing and other extrapolative skills – NOT code memorization and other rote activities. The quality of computer education makes Nysmith students competitive in robotics and Cyber events. 4th Grade: Students are reintroduced to a higher level of the Logo programming language, Adobe Photoshop elements, and Lego Mind Storm robotics. They also explore deeper levels of Microsoft Office PowerPoint, Word, Excel, and Publisher. 5th Grade: In these classes, students receive more advanced instruction in the topics covered in the fourth grade. Additionally, they are introduced to Storytelling Alice. 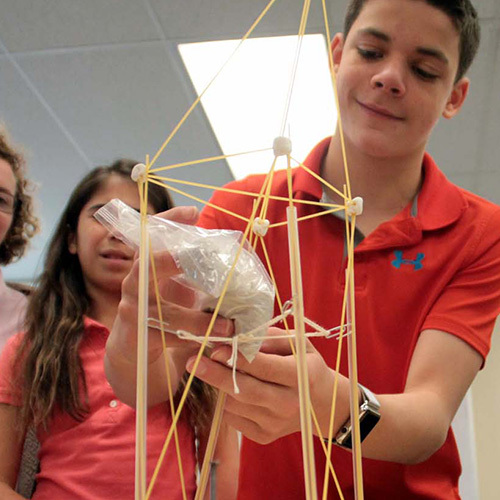 6th, 7th and 8th Grade: At these levels, the emphasis is on critical thinking and problem solving. Students work with Java, Robot C, Adobe Photoshop, Illustrator, Arduino, Auto Desk, and other key programs. 4th – 6th Grade : 2.5 hours per week. 7th and 8th Grade : Differs depending on the electives chosen. When many families think of The Nysmith School they immediately think of technology. There is a reason. We believe that technology offers a profound set of tools to present your ideas not only more easily but also more effectively. The Nysmith School began integrating technology into the children’s daily curriculum when the school first began in September 1984. In those early days we used Commodore 64s. Technology has come a long way. Many Nysmith graduates that head to Thomas Jefferson High School mention that it is typically their junior year before they are exposed to higher levels of technology than they had at Nysmith in eighth grade. Many Nysmith graduates that head to private schools, many of them great and well-known schools, comment that they are never introduced to the level of technology instruction that they received at Nysmith. The reality is that we do not introduce technology simply for exposure. We teach your child how technology can help them present their ideas in a multitude of different ways. We introduce them to programming in a nurturing and caring environment so as to help your child succeed. Your child will not memorize code; instead we teach logical sequencing. There is a reason why the Nysmith robotics teams and Cyber Patriot teams have been so successful at the national level. By introducing your child early to the joys of technology, they may find their calling in one of the facets of technology. A 1:9 ratio allows teachers to work independently with your child to help them succeed regardless of whether this is their first year at Nysmith or if your child has a profound ability in that area of technology. The classes are taught through the application of technology to solve problems and create projects. With four separate technology labs in addition to a large media center, six mobile carts, and classroom computers, The Nysmith School is able to facilitate technology to help your child succeed. 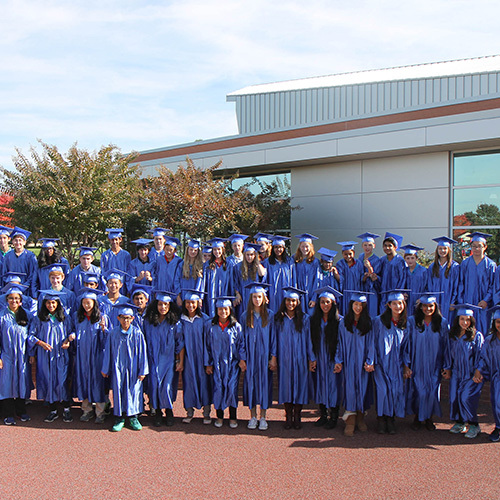 Our eighth-graders often join their high schools in the second year of their foreign language. Some even place into third year language studies. Your child will work in small groups, with hands-on projects for a deeper understanding of the foreign language. 4th and 5th Grade: Students are introduced to Spanish. 6th Grade: Students are introduced to Latin. 7th and 8th Grade : 3 hours per week. The goal of The Nysmith School foreign language program is to introduce your child to the joy of learning a foreign language in a fun, hands-on manner. We realize that children have many different abilities in foreign languages. Some Nysmith children are native speakers, some have an aptitude for foreign languages, and some children have difficulty hearing the nuances of a second language. We introduce three languages to your child over their Nysmith career in a semi-immersion process. Our goal is to develop in your child a love of languages, not necessarily fluency. With two teachers in each classroom, we are able to help your child be successful. Though our goal is to instill in your child a love of language learning, our foreign language program is extremely strong. In seventh and eighth grade, your child will take high school credit foreign language classes. Homework is minimal. Most high school foreign language classes require at least one hour of homework each evening to be successful, our program provides your child with many of the same benefits at a fraction of the required homework time. Your child will work in small groups, with on hands-on projects for a deeper understanding of the foreign language. Typically our eighth-grade graduates join their high schools in their second year of foreign language. However, some high schools have placed Nysmith graduates in the third year of foreign language sequence. The goal of this curriculum is to help students experience the joy and creativity of making music. We attempt to make every Nysmith student musically competent – defined as the ability to keep a steady beat and sing on pitch. Nysmith has a wide variety of instrumental and vocal groups – and some individual instrument tutoring is available after school. Several performance opportunities are available throughout the year, including the Holiday Sing-Along, Grandparent’s Day and the Fun Fair. 4th – 6th Grade : 30 minutes twice a week. 7th and 8th Grade : Different amounts of musical education, depending on the electives they choose. The goal of our music curriculum is to help your child experience the joy and creativity of making music. Our objective is to help every Nysmith student become musically competent – that is, able to keep a steady beat and sing on pitch. Music is learned the same way language is learned. Students must first hear it, experiment with it, and then learn the ABCs. We expose your child to music from many different cultures, pairing music with movement in the early years. Performance is an integral part of our music program. As your child progresses through the curriculum, they synthesize skills already learned to become successful musicians. The curriculum is based on the most recent research about music education from such sources as the Center for Music and Young Children, the Music Educators National Conference, and the Gordon Institute for Musical Learning. The primary focus of this physical education curriculum is helping students apply movement principles and concepts to enhance their movement performance, personal fitness, and game strategy/tactics. Students are expected to demonstrate continuous improvement in movement and locomotor skill patterns while learning such activities as soccer, bowling, tennis, lacrosse, field hockey, badminton, Frisbee golf, ultimate Frisbee, broom ball, softball, paddle ball, floor hockey, basketball, flag football, volleyball, track and field, jump bands, ping pong, step aerobics, basic swing dance, line dancing, strengthening and flexibility exercises, pilates, yoga, CPR, rope climbing, fitness testing, and bouldering/climbing walls. Students in all grades are expected to demonstrate responsible personal and social behaviors. This includes listening to instructions, sharing appropriately with others, and freely cooperating. The Nysmith School knows that the academically gifted can also be athletic. However, for a variety of reasons, we have chosen not to offer its own competitive afterschool sports teams. Nysmith’s minimal homework burdens make it possible for students to participate in after-school/weekend sports events without undue pressure. 4th Grade : 60 minutes per week. The primary focus of our physical education curriculum for your older child is applying movement principles and concepts to enhance their movement performance, personal fitness, and game strategy and tactics. They will demonstrate specialized skills alone, with a partner, or in a small group. In addition, your child will continue to develop responsible and social behaviors as they work with others in safe and respectful ways. By stressing the joy of physical activity, your child will develop positive behaviors that last a lifetime. The primary focus of our physical education curriculum for younger students is developing fundamental movement patterns, throwing/catching, and skill improvements. Children are at various levels of maturity across all skills and should demonstrate continuous improvement in movement and loco-motor skill patterns. Your child will learn how to use safe practices, cooperate with and respect others, and follow classroom rules. Our goal in P.E. is to provide opportunities or experiences that will help your child develop initiative, self-reliance, self-worth, loyalty, honesty, kindness to others, and a love of learning. All students will demonstrate responsible personal and social behaviors in physical activity settings, will demonstrate good listening skills when learning procedures and receiving instruction, and will demonstrate ability to share and be cooperative and safe with others. Students will also demonstrate independence and good use of time while practicing physical activity. Students will continuously work on their cardiovascular development along with their upper and lower body strength. Students will achieve and maintain a health-enhancing level of personal fitness and understand why physical activity is good for health. The curriculum is based on the most updated guidelines proposed by the National Association for Sport and Physical Education (NASPE), the American Alliance for Health, Physical Education, Recreation and Dance (AAHPERD), and the Virginia Association of Physical Education, Recreation and Dance (VAPERD). Provides students with hands-on experience with a wide variety of materials. Students acquire a basic understanding of art and design. Activities include drawing, painting, making prints, and sculpting with clay and other materials. Students develop their own representational, stylized, and abstract styles through independent work. Students have the opportunity to display their creativity through art exhibits throughout the year. Your child will do a lot of hands-on experiential learning at Nysmith. Studies show that children learn best; they retain more information, and have a deeper and more meaningful understanding of concepts when they work on projects tied to the lessons. At Nysmith, your child will have fun while they create art projects tied to their reading, math, science and computers classes. However, in addition to all the various projects, beginning in kindergarten, your child will be introduced to a wide variety of artistic medias at Nysmith by our artist in residence. Your child will be encouraged and nurtured to express their creativity and hone advanced artistic techniques. They will find undiscovered abilities and untapped talents to express their thoughts and ideas. Your child will have at least 45 minutes a week of art instruction that is tied together with their social studies lessons. Some of the lessons are as follows. In fourth grade the children learn to use watercolors to paint land formations. The children learn to draw the human form a portion as well as make a line figure of a Roman citizen tied together with their unit in social studies that studies Rome. The children also make a three-dimensional clays Roman figure. The children also use charcoal to draw animals tied together with the Lewis and Clark expedition studies. In fifth grade the students make a miniature sculpture tied together with a study of El Salvador. They will also re-create an Aztec calendar. In their study of European Middle Ages, the children will learn about gargoyles and will make a small sculpture of a gargoyle. In their study of the Civil War the children will re-create a sepia photograph such as those made during the Civil War. In sixth grade the children will create an abstract painting in the tradition of the African tribes the sub Saharan Africa. The children will make a piece of ceramics in the style of one of the tribes. The children will study stained-glass as well as create at one point perspective drawing. In seventh grade, along with their study about American history the children will create a poster and bumper sticker as if they were candidate for president. The children will create a portrait of a civil rights leader and a CD cover in the style of the psychedelic artist Wes Wilson. As they study the Middle East, the students will make a tile like those found in Alhambra Palace. They will also create an abstract painting using the textile designs found Pakistan. As they study the Constitution the children will make a 3-D image representing and illustrating the Constitutional amendments. In eighth grade the children will draw a realistic portrait tied together with their study in social studies of their person of courage. The children will research the architecture of furniture during the French Revolution and will design a chair based on that study.